For as long as I can remember I’ve been using the same shampoo and conditioner, Herbal Essences for dry, coloured hair – because, my hair is just that, dry at the ends and coloured. Highlighted to be exact. A love of my hair straighteners has left me with bad ends and no matter how regularly I get my hair trimmed, it’s always going to be the case. For me Herbal Essence was the only shampoo and conditioner combo that left my hair feeling soft after drying. 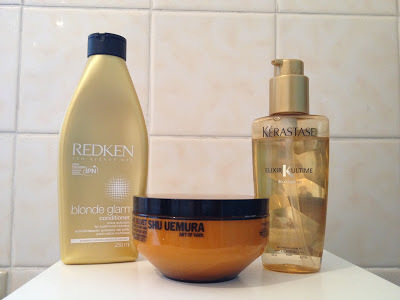 My eyes have recently been opened to three new hair essentials, Redken Blonde Glam Conditioner, Shu Uemura Art of Hair Moisture Velvet Nourishing Treatment and Kérastase Elixir Ultime. Used alone or together, these (imagine cheesy hand quotation marks here) ‘hero products’ make my hair feel incredible – and I don’t use that term lightly. My first thought is that I really, really need to get the shampoo to match. It’s light, non greasy and makes my hair manageable after washing – usually my comb fights massive tangles! A little goes a long way here, so will last for a while too. I use this once a week as a deep hair treatment. I smoother a 50p sized blob from wet roots to ends – after shampooing – and leave for a good 5 minutes. Thanks to the Camellia oil, it has nourishing and smoothing qualities, leaving my hair silky smooth. Argan, Camellia and Pracaxi, which help make hair feel silky smooth. felt so smooth and looked so shiny. What hair essentials can’t you live without?